As relatively recent transplants to New England, we are trying to make conscious efforts to do super New England-y things for a few reasons; one of which being that when February rolls around and we are sick of winter, we can look forward to the fun things that New England has to offer when it's not winter. Fortunately fall in New England is amazing, so it's the perfect time to get out and make good on those little promises. Late September and early October are prime leaf peepin' and apple pickin' season, and we cashed in on both of those this year. We went to a local orchard in Ipswich called Russell Orchards, which is right near one of our favorite places on earth: Crane Beach. Despite crowds, unhinged children, and a bit of a traffic nightmare to get there, once we got into the orchards we had a great time. We had prepared well, to the point of bringing a shopping list of apple varieties for our various applications (apple butter, roast pork with apples, apple pie, plain old eatin apples) so we quickly found our rows and got to work. 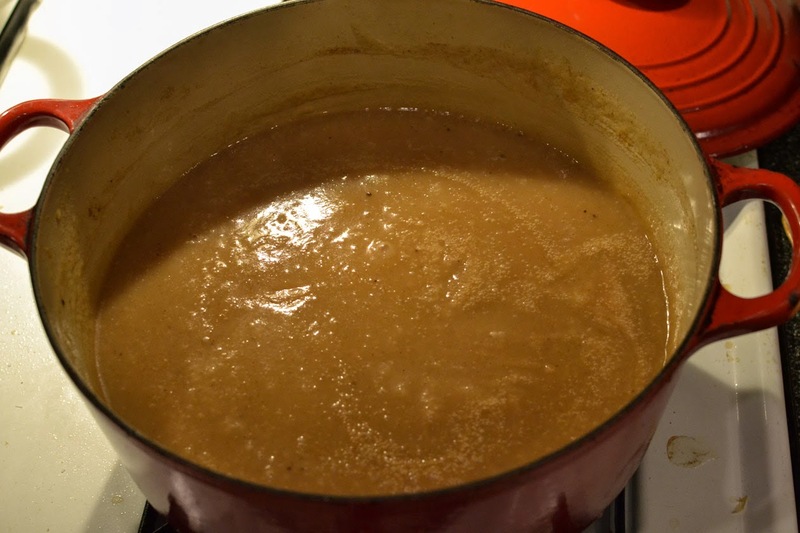 For the apple butter I chose a mix of McIntosh and Cortland. Coincidentally the McIntosh's were so good that I ended up sneaking a few more in just for eating, they were by far my favorites. Not too sweet, very crisp and not mealy at all. 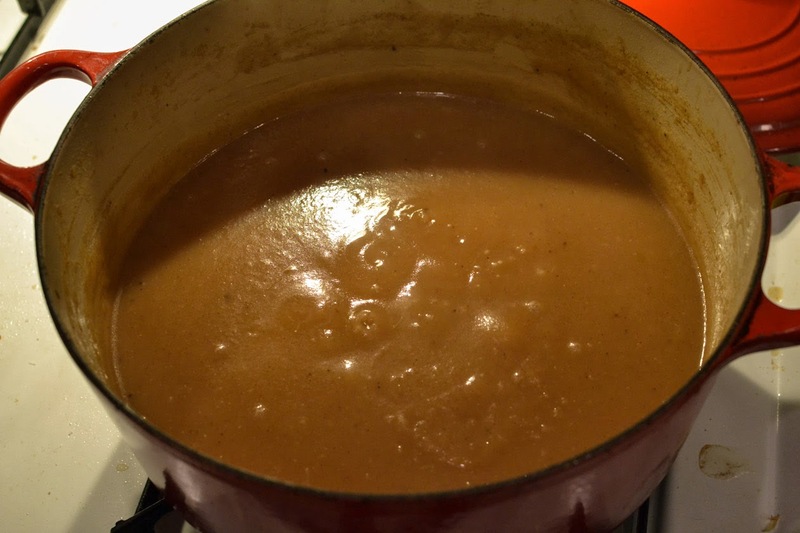 We got home and I immediately got to work on my apple butter (sneaking snacks in along the way, of course). 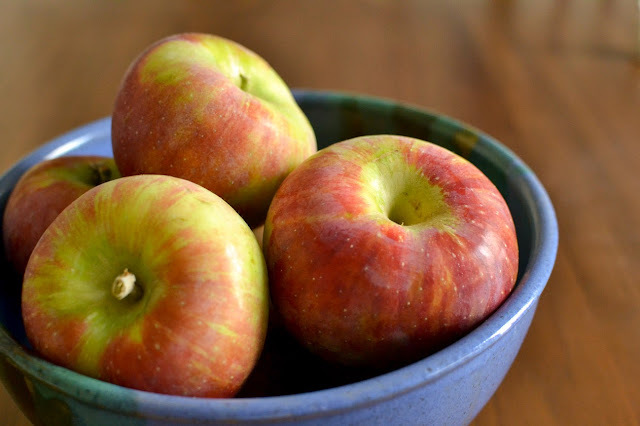 Start by peeling and coring the apples. 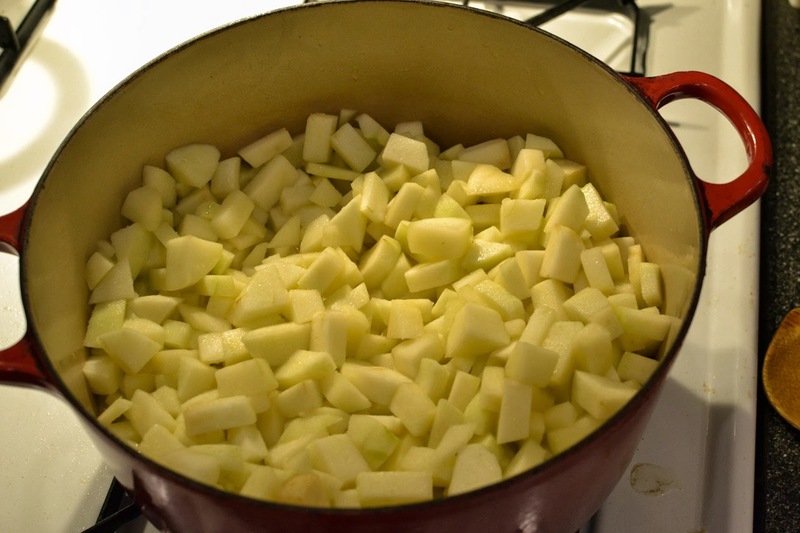 You should end up with roughly 3-3 ½ pounds of cut apples. Heat up a large pot over med/low heat and melt the butter. Add the apples and sprinkle some sugar on top of them in the pot. 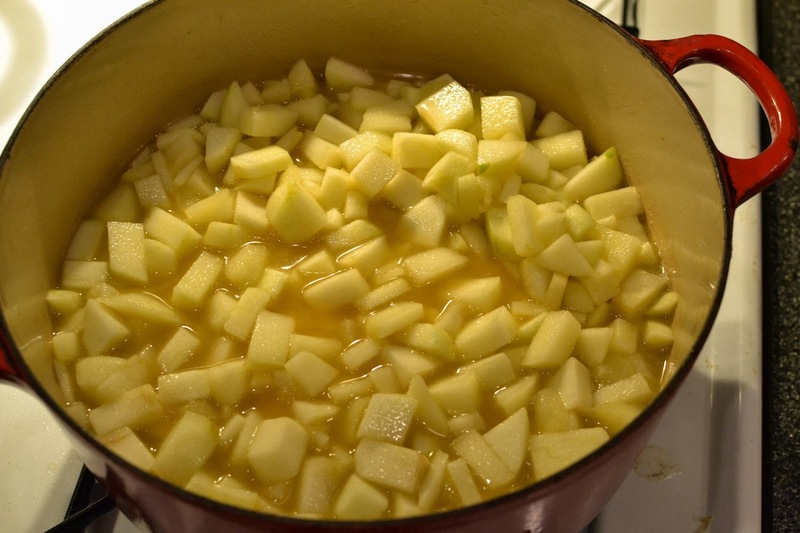 Stir to mix and cook the apples for 5 minutes, until they start to soften and are fragrant. Pour in enough apple cider to come to the top of the apples. Pay attention as you add the cider, because the apples will float. You want enough cider for the apples to simmer evenly (exact amounts are not super important because this is all going to reduce down anyway). Bring the heat up to medium and simmer the apples for approximately 30 minutes, until they are broken down and looking applesaucey. 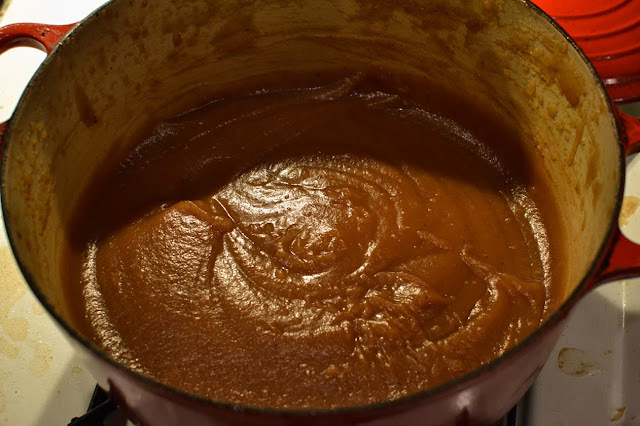 Pour the mixture into a blender (be careful blending hot liquids, blend in batches if necessary and only fill your blender about halfway up to prevent the lid from blowing off and spraying hot applesauce all over you and your kitchen). 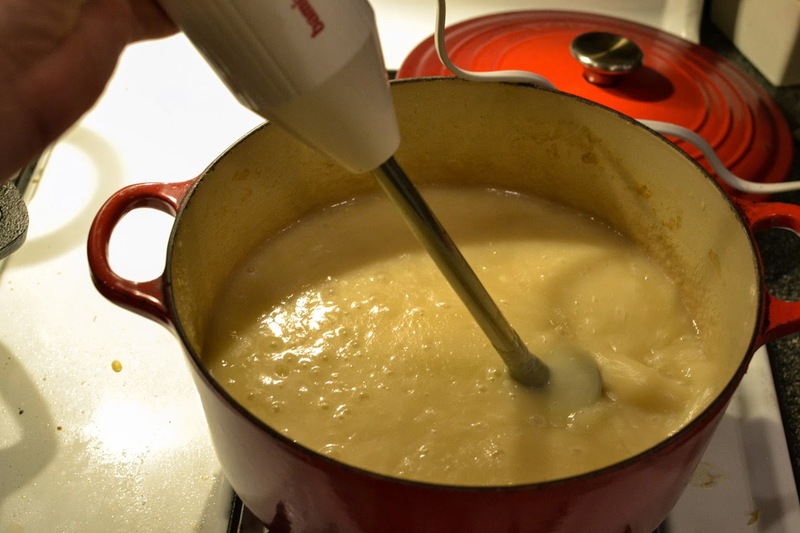 Or, if you have an immersion blender, now's a great time to make it feel like it was a solid investment. 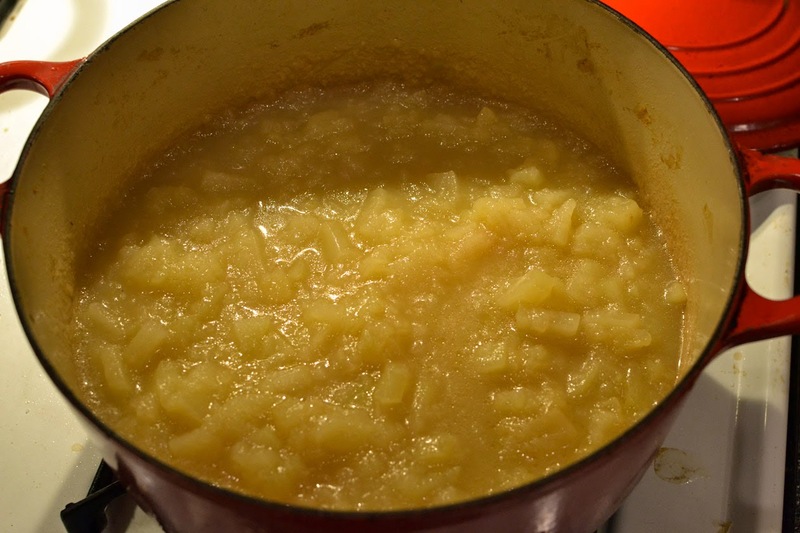 Blend the apples until they are smooth, then return to the pot. When it is heavily reduced, simply turn off the heat and allow the butter to cool. At this point, you could can it, but I have to say that canning is something that I have not done yet in my time as an amateur food jerk, so I will have to defer to one of the many other internet resources for the best way to store this for the long term. My alternative was to throw it all in mason jars and try to use it all before it goes bad. 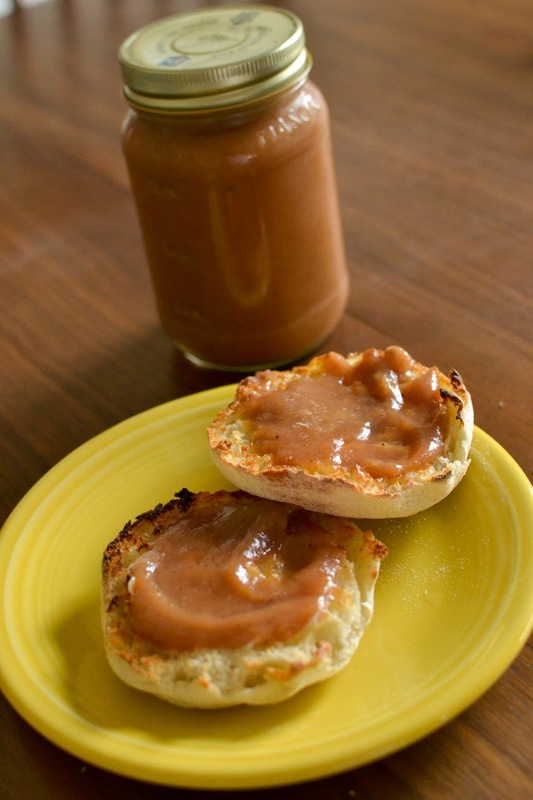 So far this is working out well for me, and it has forced me to find creative ways to work apple butter into other recipes (like, say, pork roast... or morning yogurt... or oatmeal). This butter is really amazing and totally superior to store-bought stuff, all it requires is some apples and a little patience.